Penetrates beyond the surface to maintain pliability and integrity of vinyl and rubber surfaces! Just as ultraviolet rays are detrimental to our skin and cause premature aging, vinyl surfaces inside your vehicle suffer the same fate. The windows actually magnify sunlight, accelerating discoloration, fading and cracking on the steering wheel, dash and seats. Wolfgang Vinyl & Rubber Protectant restores and conditions dull surfaces, bringing them to life. Other protectant products contain petroleum distillates as their shine agent. These sit atop the vinyl as an oily, greasy film that looks and feels unnatural. These petroleum products can actually speed up drying and cracking of the top layer of vinyl over time. Wolfgang Vinyl & Rubber Protectant is a VOC compliant, water-based conditioner that penetrates beyond the surface to help maintain pliability and integrity of the covering. Wolfgang is pH balanced and provides a natural, rich, smooth finish that lasts. Wolfgang Vinyl & Rubber Protectant also contains sunscreens to block out powerful UV rays. You'll enjoy the refreshing Wolfgang signature scent lingering after you've protected your vinyl. 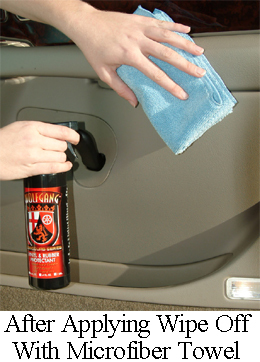 Spray Wolfgang Vinyl & Rubber Protectant on a terry cloth, terry applicator pad or a microfiber applicator pad and gently wipe down interior vinyl: seats, door panels, and dash. Wolfgang Vinyl & Rubber Protectant dries to a satin, non-reflective finish. If you prefer a less satiny finish, simply buff surfaces with a microfiber towel.